Please have your copy bound and if you wish it returned, please include a manuscript-sized SASE. Or check out www.bottletreeinc.com/script_contest.html for email submissions, Paypal options and further details. The entry fee for each submission is $25. Please make cheque payable to Bottle Tree Productions. Please do not attach your name or contact name to the script but have that information on a separate sheet of paper. The competition runs until November 30th 2010. Winners will be announced in January of 2011. If you want a critical analysis of your work please enclose a cheque for $50 made payable to Bottle Tree Productions. On Halloween Christine Atwell, author of Medium Secrets: My Hidden Psychic Life, will have a book reading in at the Irish Pub on Washington Street, (109 East Washington St. in Lewisburg), starting at 3 p.m. The entire event should be over by 5 p.m.
Christine will read a few ghost stories and other passages from her newly published book. In addition to speaking about her book, Christine will discuss the wide range of psychic experiences she's had and relate stories of experiences with ghosts. Copies of her book will be available. Payment: Five-cents per word (upon publication) plus contributor copy. We will accept .doc attachments only. The editor is looking for fictional mothman stories. The setting is not limited to West Virginia or any other regional area known as mothman territory. The editor wants tales with a solid plot and good character development. Stories should grab the reader's attention quickly and hold it until the end. The editor wants powerful and emotional tales that are creepy, chilling, disturbing, and moody. Although stories will mainly target an adult/young adult audience, we DO NOT want stories containing language or content unsuitable for children. Use Times New Roman (12). Italicize what you want italicized. Single space after sentence-ending punctuation. Greenbrier Valley Theater is now accepting submissions for the third annual “New Voices” Short Play Festival. The winning plays are given a public performance in GVT’s Festival of Community Plays in January/February 2011. This is an opportunity for local playwrights to have their work produced. A panel of professional theatre artists judges the pieces and winners are chosen in early December. Submissions are welcome from anyone, but local playwrights in the Greenbrier Valley are especially encouraged to participate. Entries should be 10 to12 minutes in length (longer plays will be disqualified) and include between no more than five characters. Plays should be appropriate for all ages (with minimal offensive material) and should be written to be played by adult actors (15 and up.) There is no official theme for the plays. Musicals may be considered depending on available production staff. Due to the nature of the festival and production restrictions, plays with single unit sets will be given priority. Entries must be received by GVT no later than December 1, 2010. The public festival performance dates are to be announced at a later date. Please email submissions to Kurtis Donnelly, kurtis@gvtheatre.org (prefered) or mail them to PO Box 494, Lewisburg, WV 24901. Please do not submit an original copy of your play, as copies will not be returned. By submitting a play to the “New Voices” Festival, you grant GVT the rights to perform your play at the festival in January/February 2011, if chosen. The number of winners selected to be performed will vary on the length of the selected shows. Anywhere from 4-7 may be chosen for performance. If an inadequate number of entries are received, GVT reserves the right to not select any play for performance. For complete details visit www.gvtheatre.org or contact Kurtis Donnelly at 645-3838 or kurtis@gvtheatre.org. Morgantown Writers and the WVU Press are co-sponsoring a Literary Arts Day that combines a Short Story Reading on Friday Oct. 29, at Arts Monongahela Gallery by the rising West Virginia novelist Marie Manilla, with a writing workshop led by the author the next morning Oct. 30 at the Morgantown Public Library. The reading on Friday Oct. 29 begins with a writers reception at 6:30 p.m. followed by Manilla’s reading at 7:15 p.m., with music entertainment, and a book signing. Arts Mon will host a reception to celebrate the WVU Press release of Manilla’s short story collection, “Still Life With Plums”, a vibrant blend of dark humor and magic realism. The workshop, “Put the 'Wow!' into Your Short Story” is on Saturday Oct. 30, led by Manilla who teaches creative writing at Marshall University. Hosted by Morgantown Writers, it will emphasize techniques that get the attention of editors and readers. Manilla’s stories have appeared in The Chicago Tribune, Prairie Schooner, Mississippi Review, Calyx Journal, Kestrel, Portland Review, GSU Review, and other journals. She has written the forthcoming novel “Shrapnel”, which received a Fred Bonnie Award for Best First Novel by a writer. The Oct. 30 workshop starts at 10:30 a.m. and ends at 11:45 a.m., at the Morgantown Public Library. There is a small fee for materials and registration is required. Seating is limited to 12 writers. To register, write to – Patricia.Patteson@mail.wvu.edu The writers meet on the 2nd and 4th Tuesday of each month, 6:30 p.m. to 8:00 p.m. at the public library. This Literary Arts program is made possible through collaboration of the WVU Press, Morgantown Writers, and Arts Monongalia. The WVU Press is the official press of West Virginia University, publishing a range of WV book titles. Arts Monongalia is a leader in promoting the arts in Monongalia County. 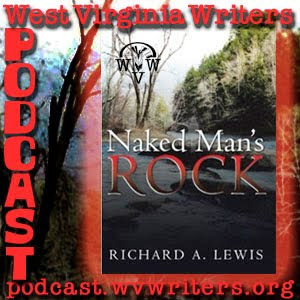 Since 1994, MWG Writers have hosted Literary Arts events and provided resources, workshops, and services for writers in north central West Virginia. Entries are to be 32 lines or less, single spaced, camera ready - the way you want to see it in print. Include SASE or postcard for acknowledgement. One-time magazine publication rights to each publisher - different months. Author’s own copyright guaranteed. SUBJECT: LOVE-old love, new love, lost love, love to be and/or love of. Download it at our Podcast Page or subscribe in iTunes. Steph F Enterprises, LLC, publisher of the upcoming anthology Return to Rural America, still needs contributors with poetry, anecdotes and short stories about Rural America. Depicting life in Rural America, after having lived or visited in urban areas of the country, this anthology will highlight the culture, the people and the aesthetic qualities of rural America. Short stories should be between 600-1,200 words while anecdotes must not exceed 300 words. Entries will not be returned. They can be sent by mail or by e-mail. The cost to enter is a minimal fee of $5.00 per entry. There is no limit to the number of entries per person. Checks or money orders should be made payable and mailed to: Steph F Enterprises, LLC, 343 Campbells Creek Drive, Charleston, WV 25306. Those selected for the anthology will be notified on November 30 by letter. All releases will be sent with the letter to be returned for publication. This anthology is dedicated to those rural communities and people in appreciation they so well deserve for preserving the American way of life. Woodland Press presents FRIGHT NIGHT. 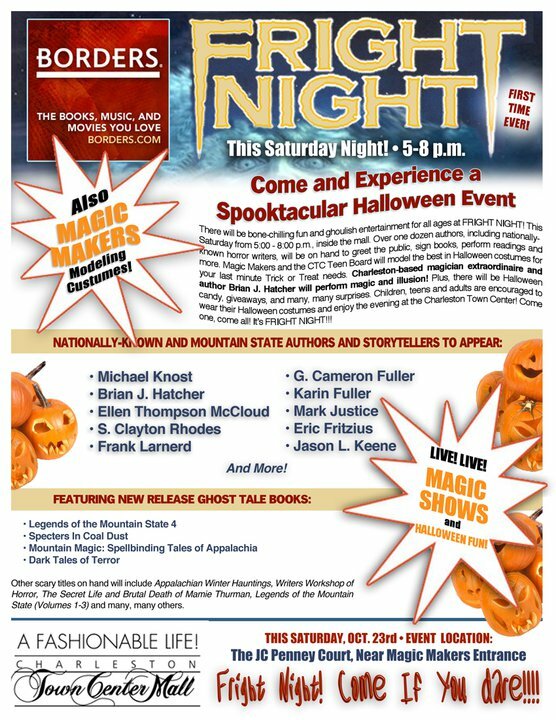 This Saturday, October 23, from 5 to 8p at the Town Center in Charleston, over one dozen authors including nationally known writers will be on hand to greet the public, sign books, perform readings, and more. Magic Makers and the CTC Teen Board will model Halloween costumes. Magician and author Brian J. Hatcher will be perform illusion. Plus there will be candy, giveaways and surprises. Taylor Books Horror Publishing Panel this weekend. Writers, editors and storytellers will appear during a Halloween Publishing and Writing Panel, at Taylor Books on Saturday, October 23, from 1:00 p.m. to 3:00 p.m. In keeping with the Trick or Treat season, the independent bookstore will be emphasizing the speculative fiction and horror genres. Panel participants will include 2009 Bram Stoker Award-winning editor Michael Knost, Brian J. Hatcher, Ellen Thompson McCloud, Frank Larnerd, Jason L. Keene, Geoffrey Cameron Fuller, Karin Fuller, Eric Fritzius, Jessie Grayson and others. Readings are planned, along with writing discussions and a time for questions and answers. The authors and editors will also be thrilled to sign books for those in attendance. Published and non-published writers, editors, book publishers and book-lovers of all ages are encouraged to attend. For additional information on these panelists, arranged for us by the inimitable Woodland Press, visit: http://www.woodlandpress.com/ ! The 2011 Scribblers' Retreat Writers' Conference series continues this November at the King and Prince Resort on St. Simon's Island, Georgia. The topic for the weekend will be Historicals, Fantasy, New Publishing Trends. Scribblers' Retreat encourages, educates and promotes budding authors and published authors of all ages while helping them to write and publish their works. We provide a favorable environment to facilitate professional connections and friendly sharing of valuable information. We are committed to the support and advancement of all writers, published and non-published. We offer four conferences with a broad variety of genres throughout the year. Attendees will experience lively, intelligent sessions presented by a carefully chosen symposium of experienced teachers, writers, editors and others from the publishing world. We are dedicated to presenting innovative and motivating conferences to host world-class authors and speakers. There will be opportunities for attendees to meet like-minded fellows and also to compete in fun, impromptu writing contests for first-class prizes. All of this we offer in a spectacular setting at the King and Prince Resort on tranquil St. Simon's Island, Georgia. Diana Gabaldon-- # 1 New York Times Best Selling Author who will offer a workshop called "Priceless advice from a spell binding storyteller." “Plays submitted must be unproduced by any theatre group,” Pelegreen said. “The play can be a little shorter or longer than 30 minutes, but it must have a solid plot and characters with whom an audience can identify,” he added. “The characters can be any age, but the plot and dialogue must be family-friendly,” he explained. Pelegreen said that submissions must be type-written in standard script format. They are to be sent to the Hope Players, P.O. Box 519, Hopedale, OH 43976. Entrants who wish to have their submissions returned must enclose a stamped, self-addressed envelope. Submissions must be postmarked by November 1, 2010. Pelegreen noted that entrants whose plays are chosen for production will be given the opportunity to work with the director assigned to their show, and may be asked to make minor revisions before production. The rehearsal and performance schedules will be announced at a later date. “We’ll only do an evening of one-acts if we get enough quality plays for a solid evening of entertainment,” Pelegreen said. “That’s why we’re calling on all area writers to submit their best unproduced, short plays. We want our audiences to see the high quality of writing talent we have right here in the Ohio Valley,” he added. WV Writers' Region 3 representative Tim Armentrout will be reading his poetry as part of Carnegie Hall WV's Brown Bag Reading series, tomorrow, October 19 from noon to 12:50 at Carnegie Hall in Lewisburg, WV. Bring your lunch and enjoy the reading. Please join us this weekend for the 2010 West Virginia Book Festival at the Civic Center in Charleston. Authors such as Nicholas Sparks, Diana Gabaldon, Civil War historian and Virginia Tech professor Dr. James Robertson, children’s author Carmen Deedy will be there as well as WV-authors Jayne Ann Phillips and Meredith Sue Willis. WV Writers' Region 3 representative Tim Armentrout will be reading his poetry as part of Carnegie Hall WV's Brown Bag Reading series, October 19 from noon to 12:50 at Carnegie Hall in Lewisburg, WV. From the io9 website, comes an article entitled "Five situations where it's better to tell than show in your fiction." 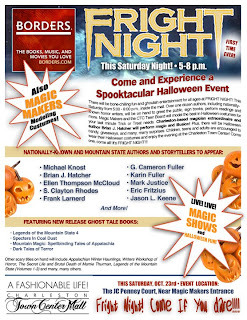 Karin is in Mountain Magic: Spellbinding Tales of Appalachia, and I have a story in Legends of the Mountain State IV. Reports vary, but from 8-15 other authors will be there. Come on down and say hi! Below are some blurbs from F. Keith Davis (Woodland Press) and Brian Hatcher) editor of Magic and magician extraordinaire) with links to a trailer made by Brian, an article that appeared in the Herald Dispatch, and the Woodland Press site. Woodland Press, LLC THIS IS IT: For the first time ever, Woodland Press will be unveiling three brand new, major titles simultaneously at Borders Bookstore, Huntington Mall, Barboursville. WV. Saturday, October 9th, 4:00 - 6:30 p.m. Eleven authors are scheduled to attend, with many surprises and activities planned. Public invited. Author Laura Ricketson Doherty will be having a book reading on Sun, Oct 10, 2010 at Irish Pub from 3 - 4 pm in Lewisburg, WV. The pub is on Route 60 on the south side of the street not far from The Open Book bookstore. You can find Irish Pub on the Internet. Their phone number is 304 645-7386. Her book is Annie Ricketson's Journal, which was published recently by Heritage Books. First place wins $1,200 and publication in Issue 82 of Glimmer Train Stories. Second- and third-place winners receive $500/$300 (or if chosen for publication, $700). Winners and finalists have been notified, and the Top-25 list is posted! Our thanks to all of you for letting us read your stories!